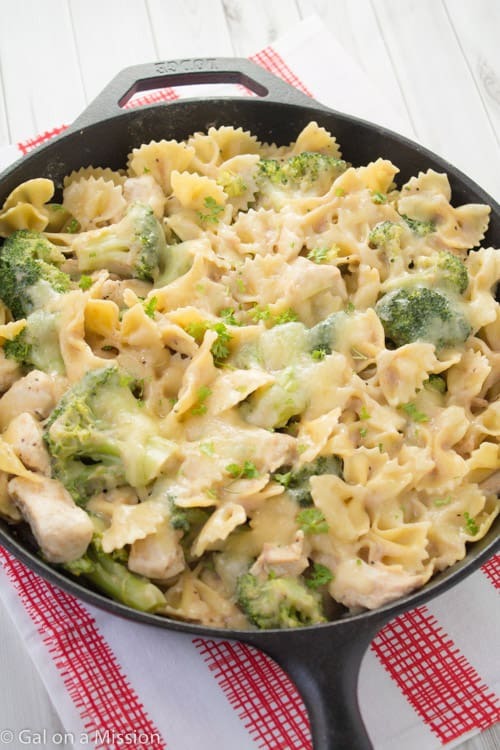 An easy and healthier chicken, broccoli, and pasta skillet casserole recipe. Ready under 30 minutes! I have been on the hunt for quick meals that are healthy and this definitely fits the description. The other day I posted a recipe for Homemade Cream of Chicken Condensed Soup and the soup is the base of this skillet bake. 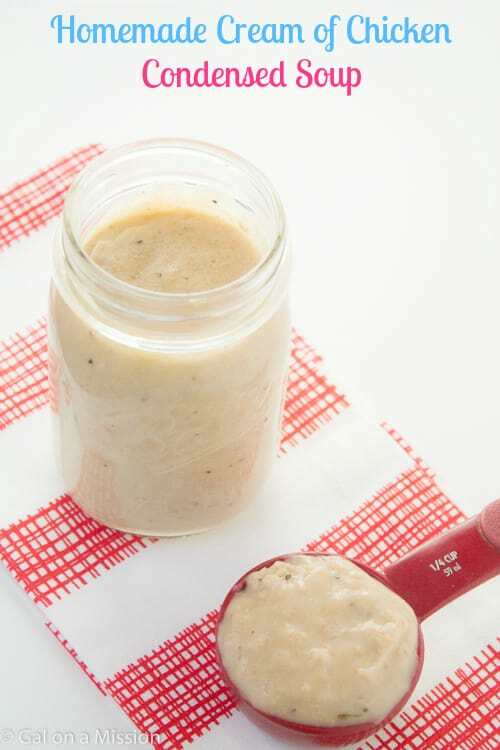 Easy, delicious, and healthy – yum! When I was a child we had many different types of casseroles because they were quick and easy – healthy didn’t always fit the bill too much. I love quick casseroles, especially if they contain all of the flavors of that canned condensed soup. 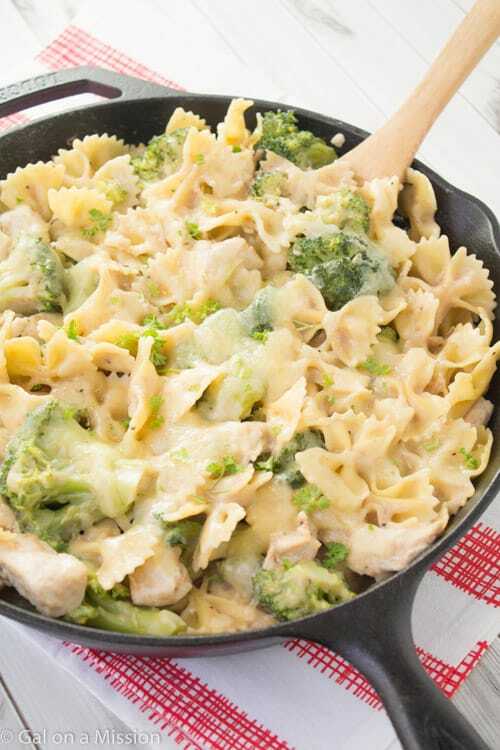 This skillet chicken, broccoli, and pasta bake is a great dinner for those nights when you are in a rush. It is filling, contains broccoli (yay for veggies), and totally cheesy! If you do not have any broccoli on hand, you can always use any kind of vegetables that you do have. I think stir-fry vegetables would be great as well. You can also switch out regular pasta for whole-wheat pasta if you want to keep it really healthy! Either way is great for me. If you have the cream of condensed soup already sitting in the refrigerator, then that is awesome! You will have to boil the pasta in a separate pot. After the pasta is finished cooking, then you can use that same pot to boil the broccoli. In the skillet cook the chicken and then dice into small chunks. I just used already cooked frozen broccoli – use fresh or frozen. After the chicken has already been cooked and diced, add in the pasta, cream of chicken condensed soup, then the broccoli. I added white cheddar cheese on top to make it a little cheesy. Broil until the cheese melts and then dinner is ready! In a large skillet, place the chicken breasts and cook on medium heat for about 4-5 minutes on each side until done. Dice into small chunks and place back into the skillet. In a large pot, boil the pasta under tender and drain. Place into the skillet with the chicken. In the same pot, boil the broccoli until it is no longer frozen. Place into the skillet with the chicken and pasta. Stir in the homemade cream of chicken condensed soup and mix everything together. Add salt and pepper, to taste. Add the shredded cheese on top and broil high under the cheese has melted. 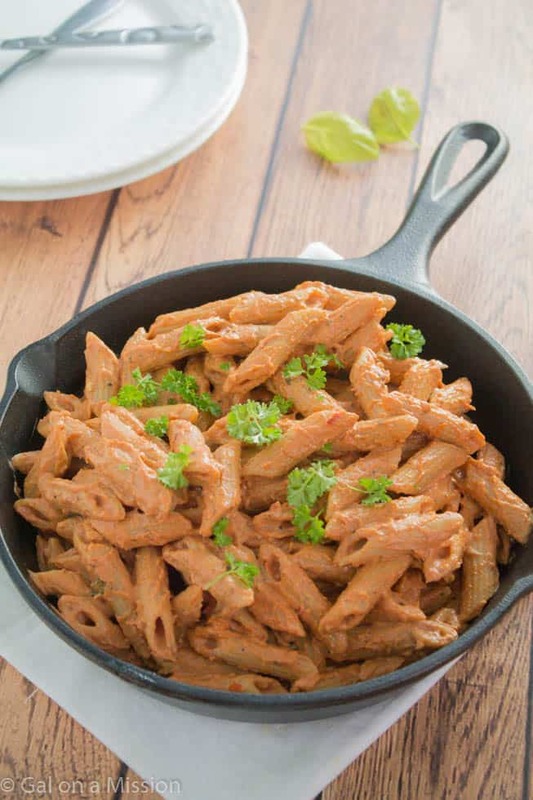 And more delicious pasta recipes! 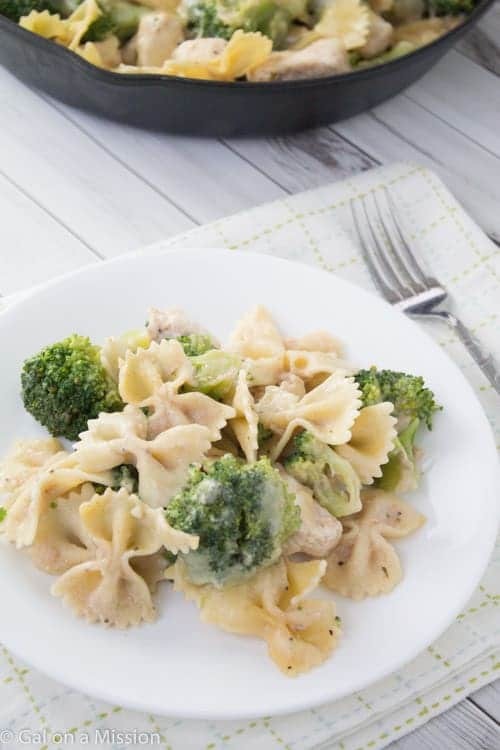 All of my kids’ favorite things in one dish — chicken, broccoli, and pasta! We will definitely give this a try. Thanks for sharing! Hmm..chicken, pasta, canned soup and cheese. That’s still quite a bit of calories. Not sure if I’d call it “healthy” but certainly healthier than other fast dinner options. Honestly, it doesn’t need the white shredded cheese. I made the home made recipe for the canned soup with 2%. I actually doubled it, halved the pasta and doubled the veg, adding zucchini. We topped it off with parm. You can use different types of pasta to make it healthier as well as different veg. Also, you could forgo the chicken and make it vegetarian. So, pretty healthy to me for a cream-sauce pasta dish. Love me a recipe that used HOMEMADE cream of something soup! Great substitute for a family with allergies! Thanks for linking up to the Weekend re-Treat Link Party! Thanks so much for this recipe and idea! I made it tonight (as well as the homemade cream of chicken soup) and it was amazing! Such a great idea and so excited to see how easy it was to make the cream of chicken soup! Thanks again! This looks delicious! I’d love if you’d come link it up on my Tasty Tuesday hop! Looks like the perfect weeknight meal. And I’m pretty sure there would be no complaints and no leftovers. Yum! Oh wow that looks great! I’m going to Pin this and try it. This sounds delicious but I wouldn’t call this a healthy meal. Pastas are not a healthy food. They are carbs which and add fat. They aren’t good carbs. Also pastas and breads cause inflammation in the body. And cheese is never healthy. But it could be worse! I can’t to try it!! 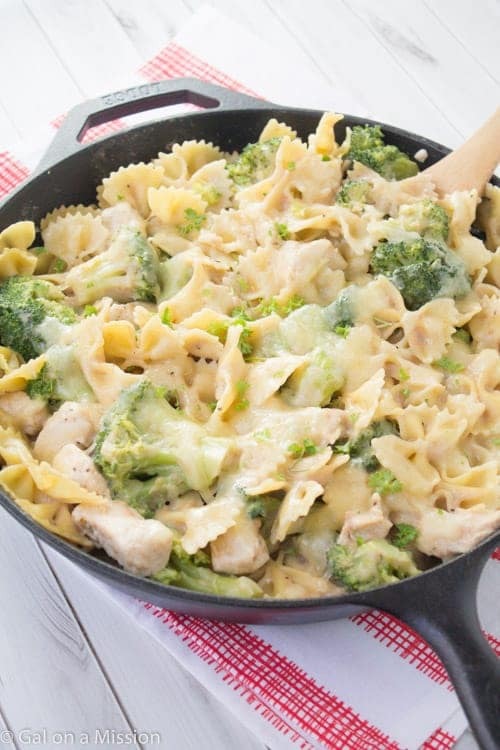 I made my own take on this recipe tonight… I made a macaroni and cheese with a spiral pasta as a base, and I added the pan cooked chicken breast chunks and boiled broccoli to that… IT WAS SO GOOD… Just me and my bf at home but there’s enough left over to feed an army! I have Crohns though and I’ve been a bit sick the past few days so I’m feeling it now, but it was so worth it. I make a similar dish with cream of mushroom- always a go to dish when I need to make a quick dinner after a long day. Next time I’ll try it with the chicken. I love how quick it is to prepare as well, Jeanine! Delicious too. what type of cheese are you using for this recipe? Hi Aspen! You should be able to double all of the ingredients to be able to feed a large amount. hi I was wondering, if I used Campbell’s cream of chicken soup, will one can be the same amount as what the recipe calls for your homemade stuff? Hi Alena! I would assume it would, but I haven’t tried it before. If I used Campbell’s cream of chicken soup, will 1 can equal the same amount of your homemade cream of chicken needed in this recipe or do I need more than 1 can? Hi Adele! I would assume it would, but I haven’t tried it before. I am making this tonight and subbing brown rice pasta(gluten free). Love the easy idea of it all! YUM! The dish came out good but a little dry. I recommend adding butter or mayo to your finished product prior to the “broil” step. I also sauteed fresh, crushed garlic for when I cooked the chicken. I was just wondering if it would be the same if I used large elbow macaroni instead of the bow tie noodles? Made this the other night & it was delicious! I used 2 cans of cream of chicken though. Very easy! I, too, added a second can of soup to the mixture as well as half a can of milk. I added minced onion and garlic to the chicken as I browned it to add a bit more flavoring. The grand kids liked it! Wow! 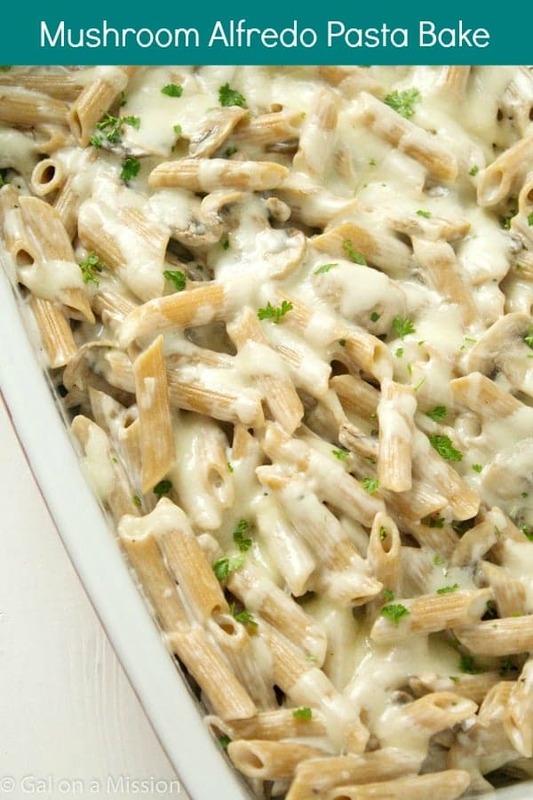 This chicken pasta meal looks super yummy and creamy. I have a similar recipe but I have added a few extra veggies and use milk and chicken stock instead of the canned soup. Looks tasty. Very interested in the homemade soup as well. I may be referring to that in the future!! This was a hit with my family! So good! I made this for dinner tonight,. I used 1 family size can of cream of chicken soup along with 2/3c of milk. I put it into the oven at 350 for 20-25mins till the cheese is melted.. So glad you and your family enjoyed it, Amy!